Over the weekend, Reader Ben Jones sent me a message on Twitter pointing me to this post by @kmgfootball, which he thought would be great for a Makeover Monday example. The point the writer is trying make is clear: Barcelona & Real Madrid combined get almost as much revenue as the rest of the clubs in La Liga, whereas in the Premier League, there's much more parity and revenue sharing. The problem is that the charts are basically unreadable. There are 20 slices in each pie. Each slices contains way too much content: team logo, team name and revenue, yet it lacks the percentage each team takes in, which is more meaningful than the revenue in this case. I recreated the data and used Tableau to build a lollipop chart instead of a pie chart. I kept the scales for the bars the same on both charts so that you could see how the leagues compare to each other. I converted the Pounds to Euros (1 british pound sterling = 1.26 Euro) to make the data more comparable. I included the share of revenue as a label on the lollipop. There are only two teams that matter to TV networks in Spain. The Premier League is very, very rich. The team will the lowest revenue allocation is higher than the third highest team in La Liga. How would you visualize this data differently? The lollipops are merely one approach. Download the Tableau workbook here and leave a comment with a link to your version. Hi Andy, nice make over. I obviously agree with all your points, but I do quite like the massive Real Madrid and Barcelona logos in the original. Very blunt, almost comical, tool for showing the power of those two clubs. Peter, I thought the same thing. I thought about creating a 3-slice pie for La Liga, but then the EPL would still look terrible. Hmm in terms of showing the income share in a proportional view could you use a set of top 3 (or two) or not for each league and show a two value pie based on that. Would be nice if it could be top x based on parameter but I don't think we have that capability yet right. Interesting idea Tarik! You're recommending grouping the top X together and then have the rest as the bottom Y? So a 2 slice pie? Exactly. Selecting the X would be nice, but like i said unsure how you would achieve that with current functionality. Download the workbook and give it a shot! Excellent work Alexander! The only change in the pies is to have the slices go clockwise. You have them counter clockwise now. Andy, thanks for bringing the order issue to my attention. The pies are neither clockwise nor counter clockwise. Pick a bigger N with the slider and you will see the pies are randomly placed. Seems Tableau doesn't provide much control to us for pie charts or I am too ignorant to know. Orderly pies would be an interesting feature I d love to see. If u have any pointers, pls let me know. You can definitely sort the pies. Choose the dimension that comprises your pie and sort it by the value. Then use this in your sort by. It will always place "Other" last. You pie slices don't need to change, only the sorting. "Others" is actually not regarded as a single entity in sorting. Instead, it's only a grouping label that's dynamically applied to the lower teams. So regular sorting just worked out as expected. "Others" is always the last slice in the pie, next to the top 1 team. Thanks for the cool tip. I think I can use it in other circumstances. BTW, one annoying thing is Tableau assigned duplicate colors in pies and next to each other. To fix it, I have to manually set default colors. - Added highlights to top N teams in lollipops. Judiciously assigned colors such as Spanish red and yellow, British blue and Wimbledon green. - Made the pie clockwise by sorting the revenue (at Andy's suggestion). "Others" is always the last slice no matter how big it is. - Added percentage along with team names to the pie label. Tableau 8 makes this easy! - Made "Others" disappear when N reaches 19. - Made sure all the slices have distinct colors by setting the default. Tableau curiously allocates duplicate colors in a pie and made them next to each other. - Let "Others" label dynamically show the number of teams in it. By stacking up two Paretos in one chart, I found it very powerful for comparing two groups of data such as La Liga and Premier League. 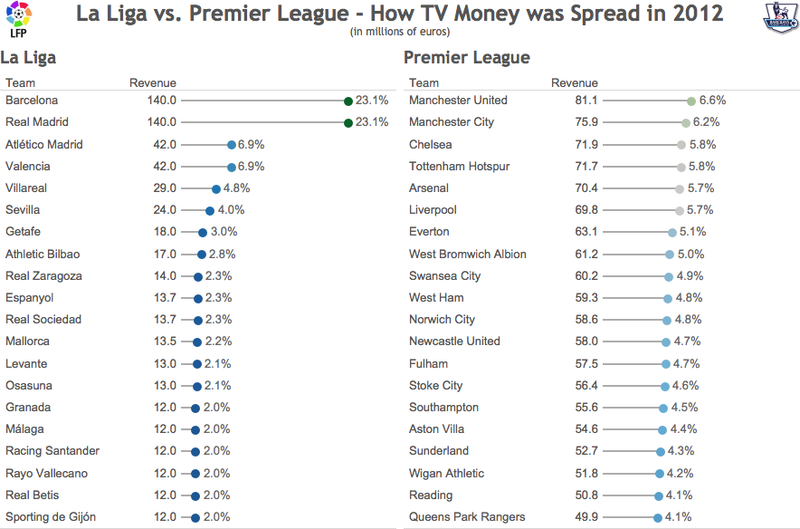 - the top 2 teams of La Liga grabbed half of the revenue, while it took top 9 teams in Premier League to achieve that. 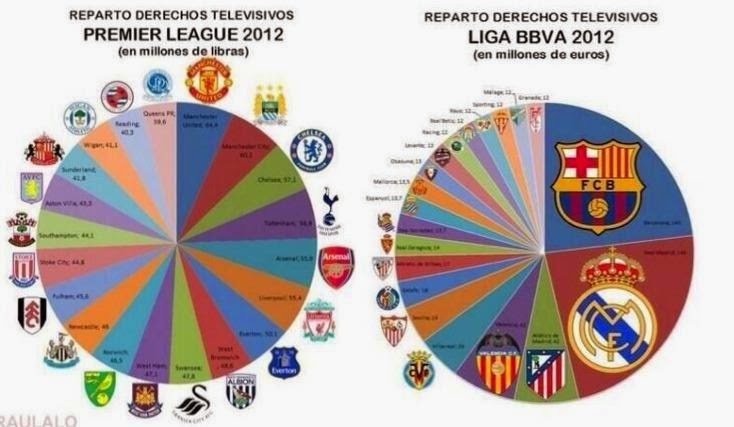 - 80% of revenue in La Liga are taken by top half of the table, while in Premier League it is shared by top 15 teams. - A straight line Pareto Chart is equivalent to equal slice sizes in Pie Chart. The smaller the variance, the straighter its Pareto chart. You're on a roll! Keep it up! Great job! It's pretty simplistic, but I think it really hammers home how disproportionate Real Madrid and Barcelona's share of La Liga's TV revenue is. I've decided to omit the names of the other clubs as I don't think they're important and they make the worksheet look messy. A step to far? Let me know what you think. Nice idea Stephen! You probably don't need the legend since you have the leagues labeled directly on the viz. Welcome to the Tableau community! Your point on lollipop vs. pie from a data interpretation makes total sense, but clearly the 'win' from a football fan perspective is to have the club logos, after all - data has to be relatable to properly articulate the message. 1. Create a secondary worksheet for each of the charts, creating a metric called 1 and setting the chart to show the logo for each club on this measure (value 1 - so that the logo will always remain in the same place, fix the axis to min 0, max 2, so that the images are centered). This chart would be a One x Club Name chart. 2. Order the clubs in the new chart by the same % revenue metric, such that the images will re-order along with the lollipops, then place the new chart to the left of the existing one, on the dashboard. 3. Hide the headers on the original chart, as the new logo chart has them. So you'd now have Header - Image - Lollipop for each club, respectively.